2. Hit the meta key, type "term", and hit enter. This proves that the dash is working normally. 3. In the terminal, hit F11 to put it in full screen mode. You can see the dash through the terminal if you have kept the translucent terminal background. The Dash has focus. You must click the terminal to give it focus, and then hit F11 to make the Dash work normally again. If you switch to another workspace, the Dash works normally. You can also reproduce this with Firefox, but of course you can't see the Dash through Firefox. 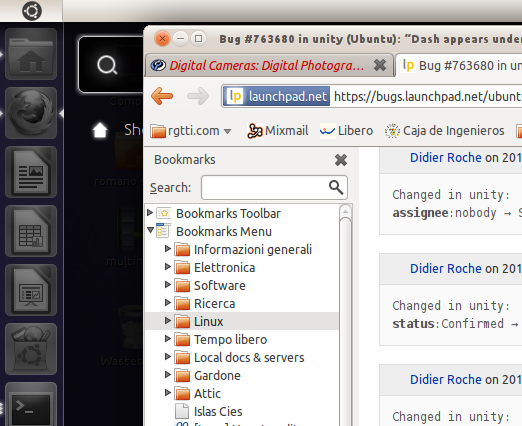 Dash/Launcher, I think the recent stack fix of compiz is doing that. It started to happen here, too. Dash (and lenses) are appearing in background, even if the app is not full-screen. Is there a way to restart unity "window manager" (launcher, panel, etc) without logging out? I have a lot of apps running and I do not want to stop them. Romano, "unity --replace" is the command you're looking for. It does help me to workaround this bug when it occurs. I don't know... all I know is that I loved to use Ubuntu 10.10... when I upgraded to Ubuntu 11.04... I can not open several applications at the same time, because then it appears a wihite screen. I have to resize the window smaller in order to make it work. Now I am working in windows, but I really miss Ubuntu 10.04. Can you tell me how can I re-install Ubuntu 10.04 ?? I'm seeing a similar issue with the Dash appearing under *all* windows, not just the ones that are full screen. Unsure when this starts happening for me (will keep an eye on it) but running 'unity --replace' solves the issue, at least until it happens again. I'm running 11.04 64-bit with Unity 3.8.16, and the issue happened on my machine with both ATI and Nvidia proprietary drivers and gfx cards. The reverse sometimes happens: If you switch to another workspace and select a previously unfocussed window, then switch back to the workspace with the fullscreen window, the dash will now be above the fullscreen window. No matter how much you click in the fullscreen window, the dash will remain above it. There is no way to reraise the fullscreen window/hide the dash once this happens, unless you have a dual monitor setup. Then you can click on the background of the other monitor and then click on the fullscreen window. I can confirm the behaviour David JB is seeing -- it doesn't happen all the time, and doesn't seem to be reproducible, but Compiz (both the Dash and the various launcher overlays) appear underneath windows and steal focus. It doesn't matter for me if the window is full-screen, maximized, or un-maximized. Using Ubuntu 11.04 64-bit, Compiz 3.8.16, on an Intel 3400 series onboard a Core i3. What does it mean ? How do I fix it??? Enviado: Jueves, septiembre 1, 2011 6:24 A.M.
Enviado: Jueves, septiembre 1, 2011 7:38 P.M. Setting "Put computer to sleep when inactive"
Uncheck "Lock screen when screensaver is active"
Since making these changes, I have not had the white screen problem. The 'white screen' with loss of all function happened when I left my computer idle for 5 minutes or longer. It seems that Ubuntu locked itself and was probably waiting for me to re-enter my password. However, I could not see the login screen. There is no white screen problem for at least several hours after logging in. At some point, an application running in a full-screen window will go white-screen, but the header of its window is still visible. Hovering the cursor in certain sections of the white screen will bring up comment windows. Objects are still in the white screens, and they are functional. I just can't see them. I can grab the header and drag it downward to make it contract into a smaller window. Almost always, making a smaller window causes the content to become visible again. Enlarging the application to full screen causes the white screen to return. Idling the terminal results in a white screen with no borders or features. With the default installation of 11.04, It was necessary to power off and power on to restore the system. the white screen goes away with a mouse jiggle or any keyboard activity. This seems to indicate that the screensaver does not work on my installation.